‘Toboggan-Marche’ by Michel Langlois, published by Loret & Freitag (Paris, sd) and illustrated by Georges Morinet. This cover for the Toboggan Marche depicts a water chute, a still popular amusement park ride. 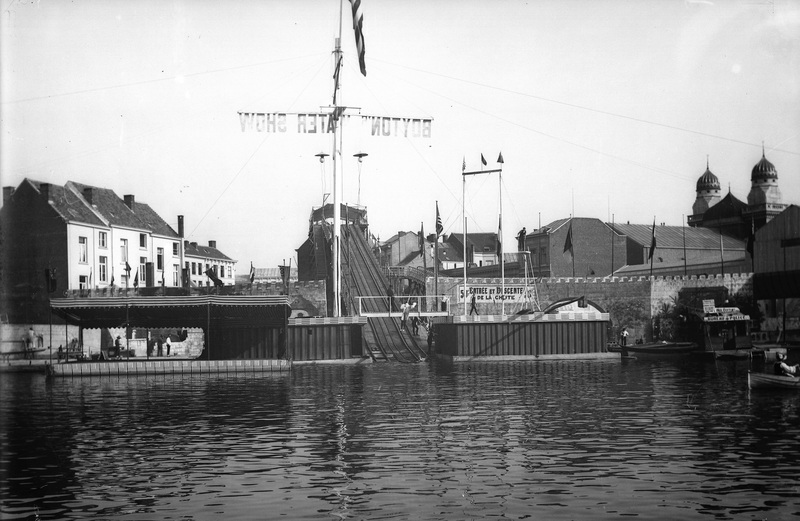 The funfair boat races down the chute tower and hits the water with a mighty splash. Here the imagination of Georges Morinet, an illustrator and photographer of Nantes, runs wild, curiously morphing one of the big waves into a triumphant naked woman. The round front makes the boat skip over the water, bouncing up and down, soaking and thrilling the passengers. What a wet frisson! 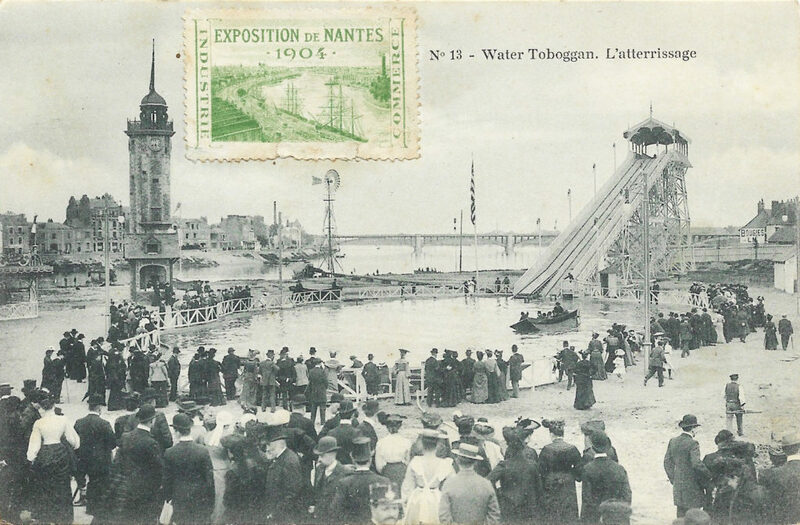 A post card of the Water Toboggan at the Nantes World Fair, 1904. This and other mechanised rides were imported from the United States to European fairs and exhibitions. 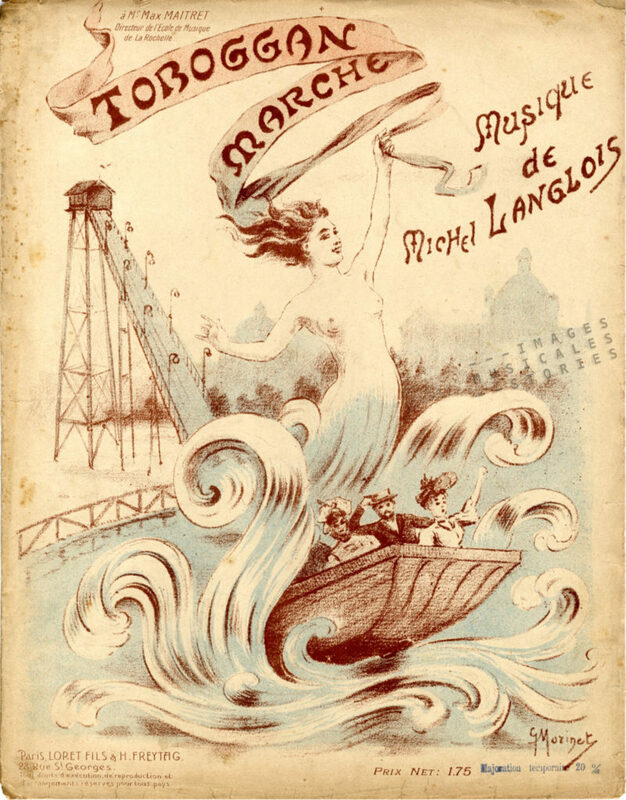 In this case it was for the 1904 World Fair in Nantes, where the ride was called a Water Toboggan (toboggan is the French word for slide). At that time the Shooting the Chutes as it was known in America was already a decade old. 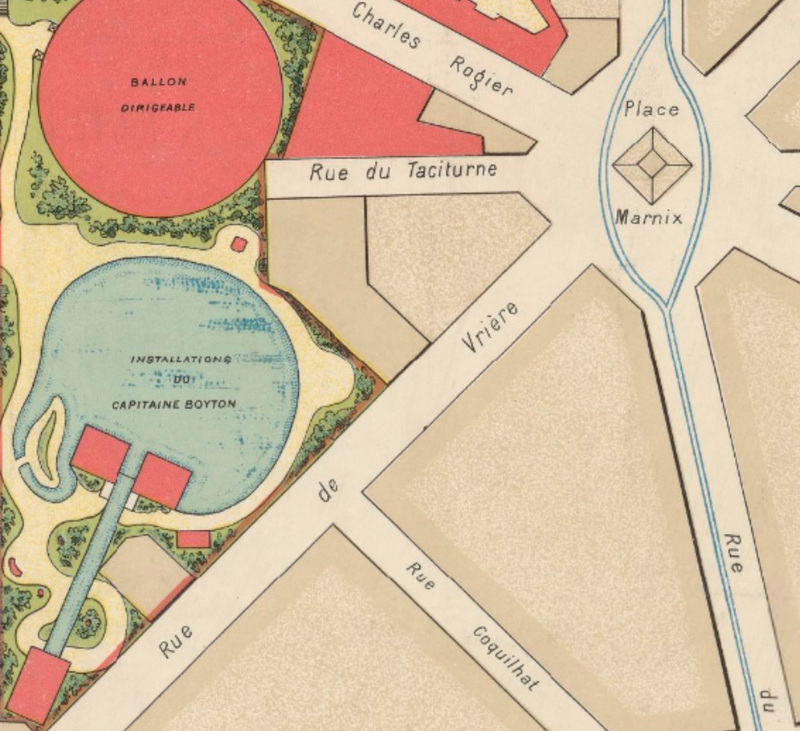 The map of the 1894 Antwerp World Fair shows us that —already at the end of the 19th century— visitors enjoyed a water attraction in Belgium. 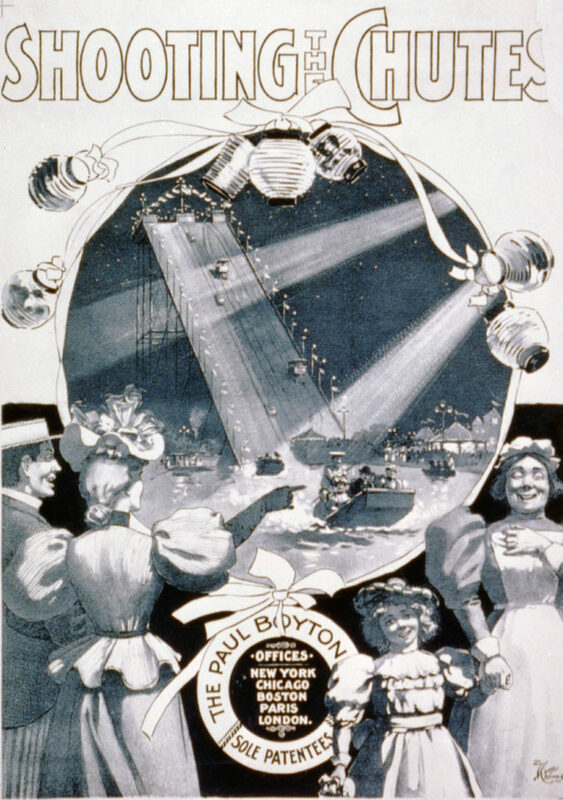 It was Captain Paul Boyton’s American company which provided the entire ride, boxed and shipped. Now this Captain Paul Boyton was a very entertaining person. In 1894 he opened the first permanent mechanised amusement park in Chicago. But prior to that he swam up and down rivers across America and Europe in a rubber immersion suit, that he himself did not invent. 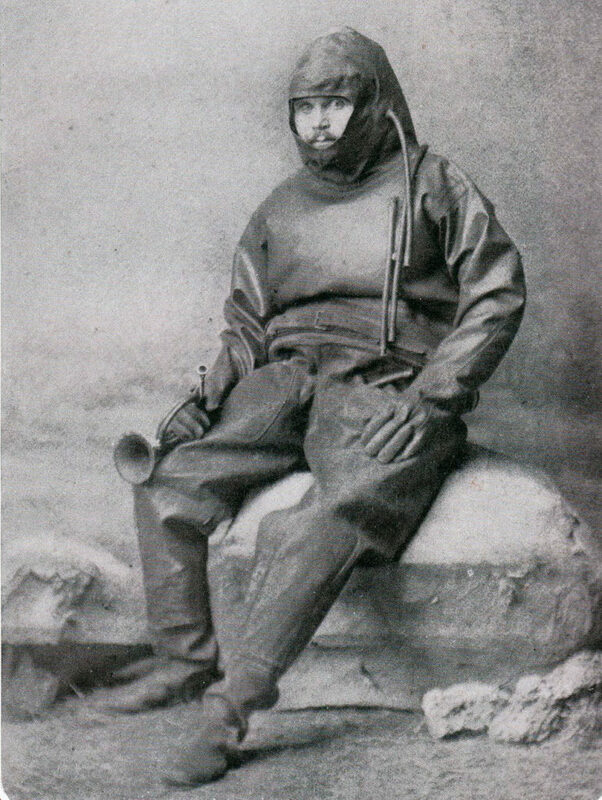 Captain Paul Boyton in his immersion suit. 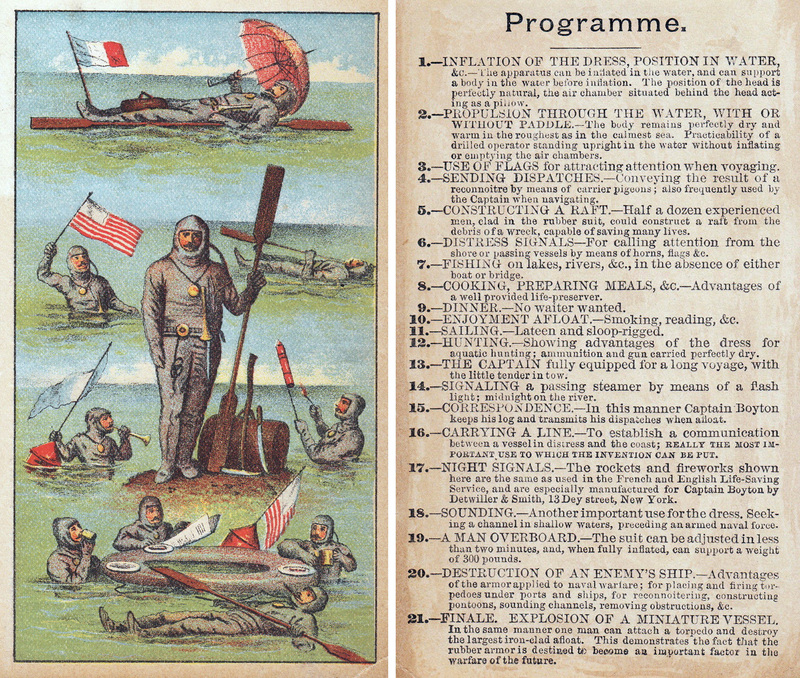 It was inventor Clarke Merriman who in 1872 had created the first-ever rubber survival suit to rescue passengers should their vessel capsize in cold water. 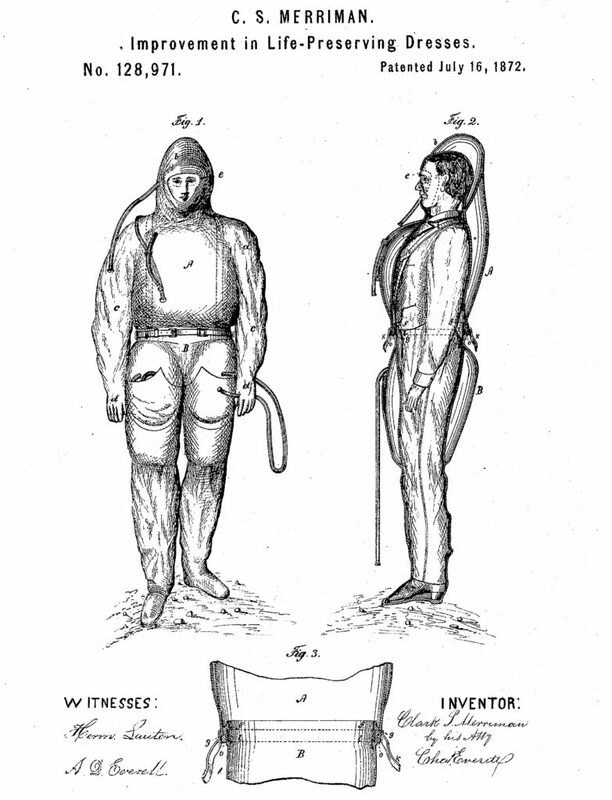 Merriman’s patent for a survival suit, 1872. Source: google patents. 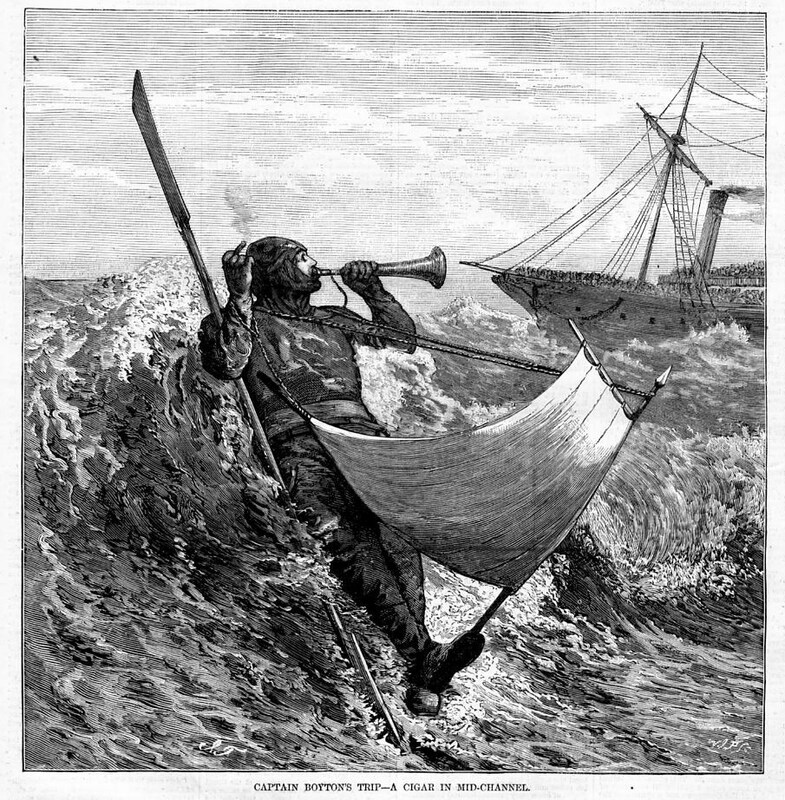 He also crossed the Channel from England to France with a canvas sail fixed to his left boot while leisurely smoking a cigar. It took him 23 hours and 30 minutes and three meals of beef sandwiches with a nice cup of strong green tea. The advertising card hereunder lists some of the extraordinary uses for the life-saving immersion suit, promoted by Captain Boyton all over the world. 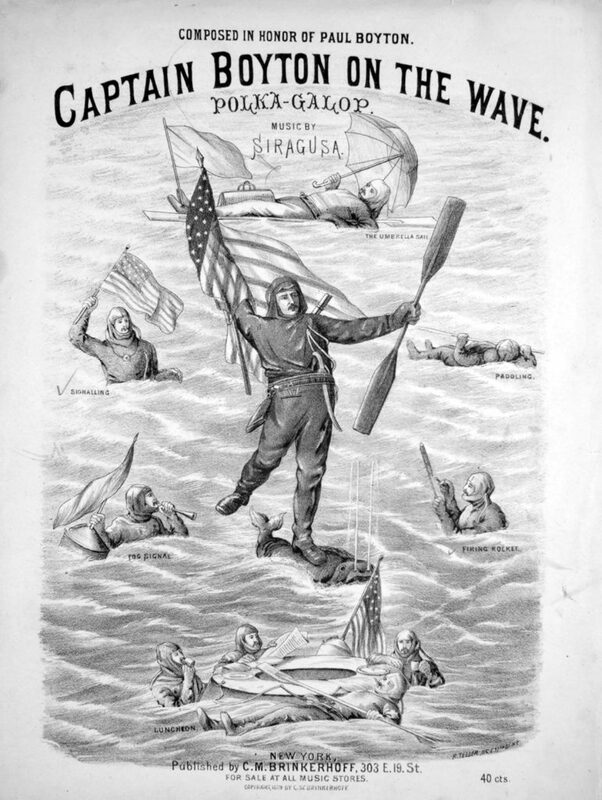 Captain Paul Boyton on an advertising trade card. For a while Captain Boyton starred in P. T. Barnum’s Travelling Circus, before starting to manufacture his aquatic attractions. The most successful one was unmistakably the Shooting the Chutes or Water Toboggan as it became known in Europe. Night view of the Shooting the Shute, manufactured by The Paul Boyton Co, 1896. New York: Miner H.C. Litho. Co. Photograph. Retrieved from the Library of Congress. And we all know now that the water toboggan became a permanent success, bringing mankind rapturous delight! 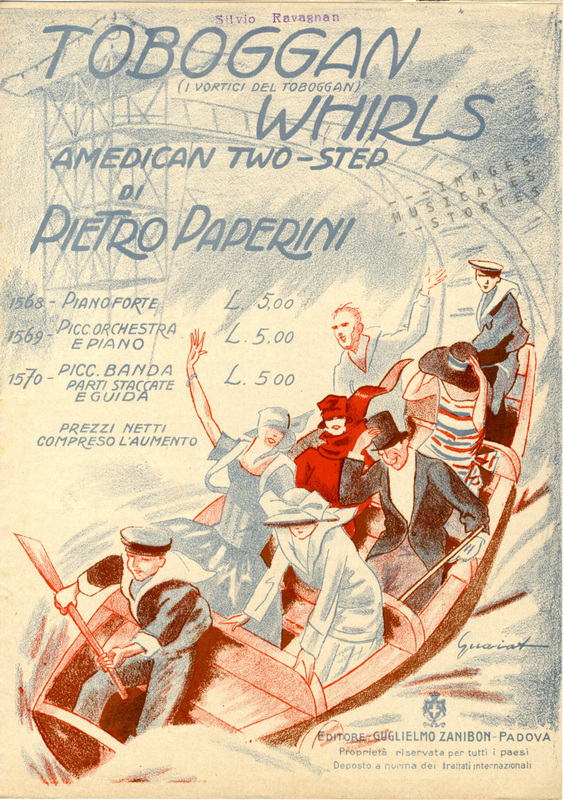 ‘Toboggan Whirls‘ by Pietro Paperini, published by Zanibon (Padova, sd) and illustrated by Guaiat.